We recently welcomed a new music librarian at the university where I work. I used to be the music librarian but had moved into a new position, and found it difficult impossible to do both jobs, particularly since it involved two buildings and two offices. I am very excited about the librarian we hired! In my work culture, we have a time each day where many of the staff members and maybe a few of the librarians gather for break in the main library. 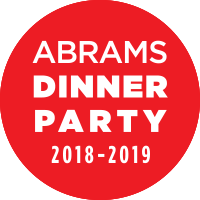 On days of celebration, we have "official" breaks - welcome breaks, goodbye and good luck breaks, birthday breaks, anniversary breaks - we love to have parties and bring food in that we've made. 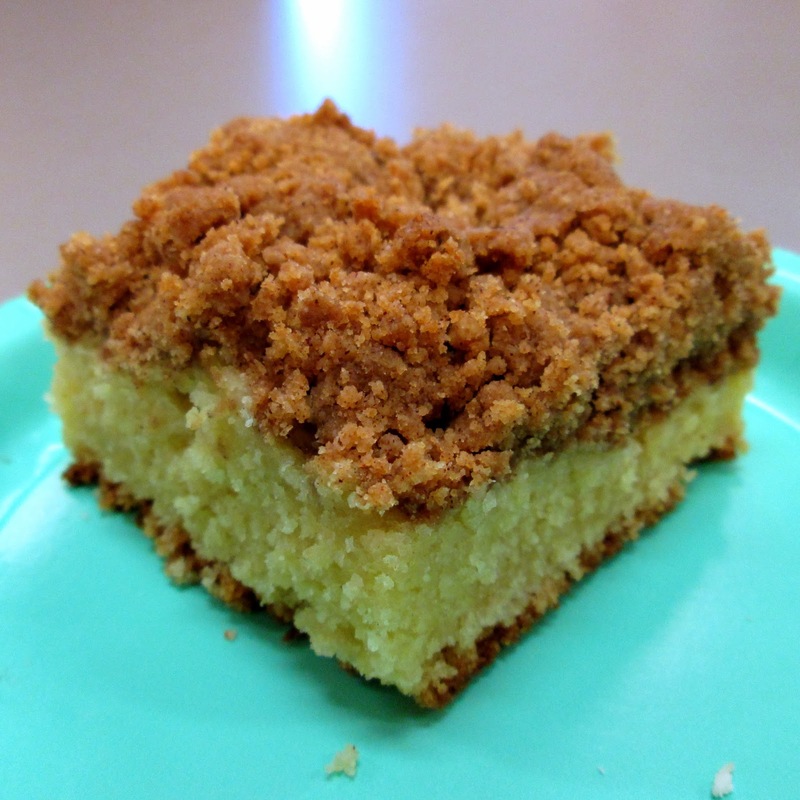 In trying to decide what to make for the welcome break, I couldn't get a crumb cake picture out of my head that I'd come across on the Cakespy blog. I decided that a crumb cake was the way I was going to say "Welcome!" This is a great recipe, highly recommended. The only tip I'll add is not to mound too many big crumbs in the center, because I had a harder time getting that part to bake through. Recipe from Jessie Oleson Moore from Cakespy on Craftsy, adapted from The Food Maven. Link to Craftsy includes photos of almost every step. Prepare the topping. In a large bowl, sift together the flour, cinnamon and salt. Mix with the brown sugar. Set this to the side. In the bowl of a stand mixer (or using a hand mixer,) cream the butter until smooth. Add the sugar, and continue mixing until light and fluffy, about 5 minutes in a stand mixer. Scrape the sides of the bowl as needed using a rubber spatula. Grab a handful of the crumbs and break on top of the spreaded cake. Continue, making crumbs of your desired sizes all across the surface of the cake. You need to cover all of the surface with crumbs, or the cake may bubble over the crumb mixture. Gently pat the crumbs into the batter with your hand or a wooden spoon, but don’t press too hard. Similar in look and feel to Martha Stewart's New Pies and Tarts: 150 Recipes for Old-Fashioned and Modern Favorites, this cookbook will have something for everyone. There are a few updated recipes for specific diets (a sprinkling of gluten-free) but most of these recipes are solid, traditionally based cakes. There are as many recipes for bundts and loaves as there are for layer cakes, so this cookbook puts more emphasis on simplicity of form. This means plenty of recipes for bakers who don't fancy themselves as cake decorators! I made the gingerbread loaf but because of user error had to throw it away (too much salt!). I made the Chocolate and Hazelnut Meringue Cake for New Year's Eve. Hmm, must be the season. The nice thing is, there are recipes for every season. There is even a cake for when gardeners have an abundance of summer squash! The one omission I am really surprised about is that the recipe for the best cake ever, the Salted Caramel Chocolate Cake from Martha Stewart Living, would be left out of her first cake cookbook. It is a recipe I recommend to everyone and always hear rave reviews when I make it. I was sad not to see it here, but since the rest of these recipes come from the same editorial crew, this is a solid cookbook. In all my Turkish cooking and baking in 2013, there is definitely an importance placed on some of the beverages consumed on a regular basis. Tea is what is mentioned most often, served as a sign of hospitality and consumed throughout the day. Most people are aware of Turkish coffee served in the tiny cups, but what about sahlep? Since Christmas I have attempted to make Turkish coffee and sahlep, and this is the tale of the two drinks. I read the directions for Turkish coffee many times before my first attempt. Use only the most finely ground of Turkish coffees, and use the very specific pot that is wider on the bottom with a wooden handle. (I got these for Christmas, so that was easy. Check!) Mix the coffee into the water cold. Stir in sugar and a pinch of cardamom. Let it just come to a boil and pour some of the foam into the cup. Let it come just to a boil twice more. Well, it never completely boiled, since I had it at such a low heat. I let it pucker a bit and called it good. I had no idea if I had done it right, but later that week we had "Egyptian" coffee at an Egyptian restaurant and it tasted pretty much the same. So hooray, now I can make Turkish coffee! Sahlep is a hot drink, often consumed on snowy winter days, which is supposed to be made from the sahlep powder, from the orchid that is also used for the so-called chewy ice cream. I was in an international market and got very excited to find sahlab powder mix. There is even a picture of an orchid on the cover! It was not until I got it home that I realized it is just salep-flavored cornstarch. I was so disappointed! Plus it is from Lebanon, not Turkey, which explains the language variation. I do not believe I have had sahlep as of yet, but am on a quest for the actual powder. At one point, when reading about chewy ice cream in The Kitchen as Laboratory, I learned that it was illegal to export salep from Turkey. If this is the case, I will not get to actually try this drink until I make a visit. It seems like a warming drink, even if what I made was not authentic. If you find salep powder, the New York Times had a pretty simple recipe for it. The box mix I picked up recommended also adding a little orange or rose water to it when serving it. The gorgeous photography in this cookbook made me long for a neighborhood bakery like Butter Baked Goods. Since I don't live anywhere near Vancouver, BC, I am very lucky to have the cookbook to help me recreate their treats. The recipes reflect what is served in the bakery and cafe - muffins and scones, cookies, bars, cakes, cupcakes, pies and tarts, and then there are the marshmallows. Butter is famous for its marshmallows, in all flavors, and also a component in several of the recipes. Several variations are contained in this cookbook, and that is what I'm looking forward to trying the most. I'm thinking of coffee flavor! I also have my eye on the Smores Bars, which look incredibly decadent, and utilize the handmade marshmallow. Since I bake so often for other people, and bring things to work, I like recipes that are simple. I'm particularly enamored with the bar cookie chapter, which includes the very Canadian Nanaimo bar that is a must-try when baking Canadian! Since I received a copy of this in the fall, I immediately made the Pumpkin Chocolate Chip Blondies, which were a huge hit!